Café Pappaya at Kochi is an innovative restaurant opened by young director Aashiq Abu. This bistro is a joined venture started by Aashiq along with few of his friends. This would be a perfect place for Kochiites for a perfect hangout at less cost. Read more to get details about Café Papaya. After actor Dilpee and Nadirshah made news after opening 'De Puttu', a restaurant exclusively for a variety of food items, now it is the turn of director Aashiq Abu to venture into the new business. Named Café Papaya, this would be an innovative restaurant situated at Palarivattom Kochi offering dishes at lesser cost. Kochiites can have a hangout at this place along with their dear ones. After making a key spot among young film makers in Kerala, Aashiq Abu has chosen a different path to show his skill. This new restaurant 'papaya, music, movies and mocha,' or in short 'Cafe Papaya' would add more colours to the taste of Kochiites. 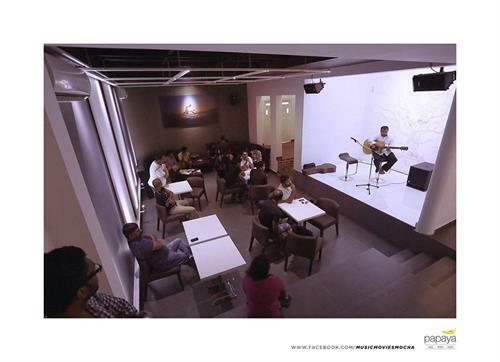 More than being a cafeteria, 'Café Papaya' welcomes the visitors with music, art, cappuccino and many others. This restaurant is a joint venture of OPM cinemas (owned by Aashiq Abu) and Papaya Media. While entering the restaurant, the guests are greeted with music along with coffee which is projected as the hallmark of the restaurant. You can enjoy the taste of various types of coffee, French omelet with or without cheese, cookies and others fitted for the taste of the visitors. Adding more to it, this ravishing restaurant features a library with good collection of books. Musicians would be performing live music while theatres for watching movie preview, facilities for stage performances are also arranged here. music, movie or any other art seriously. It is also suitable for conference or gathering of those likeminded people. For those had been living in metros like Bangalore, Chennai, Kolkatta or Delhi, Café Papaya would be ideal hangout for them. For foreign tourists and non-resident Keralites who would be paying visit to Kerala, Café Papaya can be a safe place to enjoy the light moments.